Last weekend I visited the charming Wiltshire town of Bradford on Avon for a bit of browsing and sluicing with fellow members of the PG Wodehouse Society — the first, we hope, of many gatherings in the South-West. Our luncheon took place at an outstanding local pub called The Longs Arms and we were unanimous in the view that, should we ever extend our activities to include compiling a Pub Guide for Wodehouse fans, the Longs Arms would make a worthy inclusion — the only obstacle being a lack of any obvious Wodehouse connection, unless you’re prepared to accept Haddock on the menu and the Mullineresque conversation of our very own ‘oldest member’, Graham. From the moment I alighted from the train at Bradford on Avon, I was struck with Wodehouse associations (not at the base of the skull with an eel skin, fortunately). The most obvious of these is the town’s celebration of The Gudgeon in the title of their town newsletter, a local ale, and more. The Gudgeon they’re honouring is of course the fishy variety, and not the memorable character created by P.G. Wodehouse. Hilda Gudgeon has long held a special place in my heart, though she appears only briefly in The Mating Season as Madeline Bassett’s school friend. Bertie describes her as ‘a solid, hefty girl, of the type which plays five sets of tennis without turning a hair…’. This Gudgeon is refreshingly unlike Madeline, and Bertie is initially disposed to like her (a view he revises when she offers to boost his chances of a union with Madeline). The solid girl said she didn’t see what was so particularly hot about it, adding that personally she found all mornings foul. She spoke morosely, and I could see that her disappointment in love had soured her, poor soul. I mourned for her distress, and had the circumstances been different, might have reached up and patted her on the head. As you may recall from a previous post, cricket was my first love before discovering Wodehouse, and I’ve always looked on Hilda Gudgeon as a kindred soul –I even made her the central character of my attempt at Wodehouse homage. Seeing the Gudgeon so revered by the good people of Wilshire filled me with joie de vivre. I purchased both their newsletter and their ale – and what’s more, I’d do it again! Leaving Gudgeons to one side for the moment (preferably not in the sun) there are Wodehouse connections in the area around Bradford on Avon. Young Wodehouse spent boyhood holidays with relations in Wiltshire and nearby Somerset, making it probable that he would have visited the town. His mother’s family, the Deanes, excelled at the production of spinster Aunts, a gaggle of whom lived just five and half miles away in the village of Box. Deanes also pop up in the registers at Freshford, three miles to the West, and the area known as ‘the Deverells’ is roughly twenty miles away. 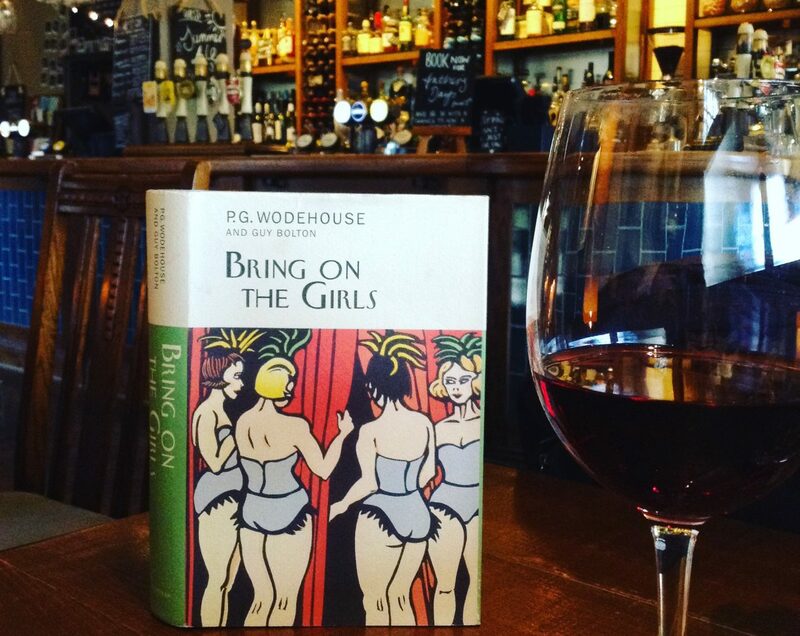 This combination of Aunts, Deverills, Gudgeons and Haddock can only mean one thing to a Wodehouse fan – The Mating Season. We may never know if young Wodehouse passed the Longs Arms on a country walk, or called in for a whiskey and splash with the local raconteur, but if you’re looking for a fine lunch in Wodehouse territory, I heartily recommend it. Better still, why not join us next time? We’re planning further exploratory jaunts in the region so please get in touch. We look forward to meeting you, although… I can’t promise that I won’t slap you on the back and address you with offensive familiarity — in the spirit of the Gudgeons. The solid girl, whom I had dimly heard telling the gardener he needn’t be afraid of breaking that spade by leaning on it, came back and immediately proceeded, in what I considered an offensively familiar manner, to give me a hearty slap on the back. ‘Well, Wooster, old bloke,’ she said. ‘Well, Gudgeon, old bird,’ I replied courteously. A hearty farewell to you! Well done, Wiltshireites and Wodehousians. Kudos Glossop old bean! What ho, Ken! The pleasure was mine entirely. It is a rummy thing about Wodehousian groups, I rather herd the local cats here in Melonsquashville, and at every gathering the pleasure is almost always mine too. I was aided and abetted by an excellent chap called Graham. He was the first to get in touch following my call to the South-West and did all the difficult business of pub selection and table arranging. Ah, how often I’ve wanted to alight from the train at Bradford-on-Avon! Such a pretty spot. Alas, I was always headed for somewhere perfectly foul, like Trowbridge. Jon, I have yet to alight at Trowbridge so it still has a certain air of mystery and allure to me. I may keep it that way for some time. So you retired in high Gudgeon? Now, that’s a beautiful thought, Noel! I am going to pinch that one and slip into conversation sometime — just to see what happens.